Samoyed is a breed of dog that takes its name from the Samoyedic peoples of Siberia. Samoyed's are excellent companions, especially for small children or even other dogs. Samoyed's thrive on human companionship and do not do well when left alone for extended periods. They are an easy to keep breed, thriving on smaller amounts of high quality food. The Samoyed is a medium sized dog, squarely built, sturdy dogs with a fluffy plumed tail curved over the back and drapped to one side. 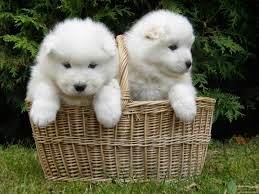 Samoyeds can be a bit independent and to best with early training and socialization with a firm but gentle hand. The Samoyed has a compact muscular body. The wedge shaped head is broad and slightly crowned. The Samoyed is a gentle dog. Very devoted, easygoing, friendly and quite playful, it loves everyone. Extensive grooming is needed. They are seasonally heavy shedders. The fluffy double coat needs frequent brushing, but tends to stay while without bathing. The Samoyed will do okay in an apartment if it sufficiently exercised . It is very active indoors. The life expectancy is about 12 to 15 years. 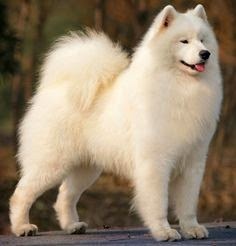 The Samoyed have lived in Siberia with hunters and fishermen known as Samoyed's, hence where the breed received its name . 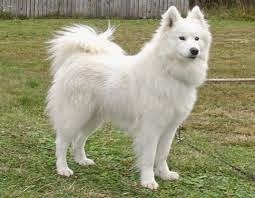 The Samoyed people used the dogs to pull their sleds, guard their property and for herding reindeer. 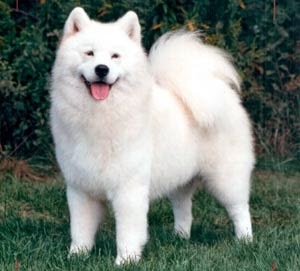 The Samoyed dogs are brought to England in 1889. It was in England that the breed further developed and there it spread throughout the rest of the world. It was recognized by the AKC in 1906. 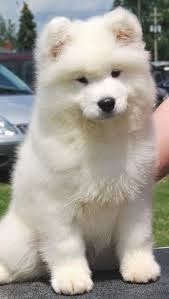 The Samoyed male weight 23-30 kgs while female weigh 17-25 kgs. The height of males 21-24 inches and for females 19-21 inches. The eyes of Samoyed are usually black or brown and in almond shape. Ears are thick and covered with fur, triangular in shape and erect. They are almost white but can often have a light to dark brown tint. The Samoyed tail is one of the breed’s more distinguished features, the tail is carried curled over the back . Tail, long and profuse, carried over the back when alert. 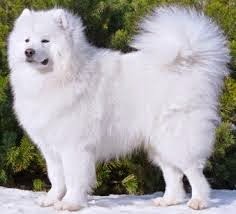 Samoyed's have a dense, double layer coat. The topcoat contains long, coarse guard hairs, which appear white but have a hint of silver colouring. The under layer, or undercoat, consists of a dense, soft and short fur that keeps the dog warm. Samoyed's friendly disposition makes them poor guard dogs, an aggressive Samoyed is rare.